This wooden cutting board set I found at the Peterson AFB Exchange for only $9.99. A wood cutting board? Really? Yep. It's a variation on an old tailor's trick, the tailor's clapper. 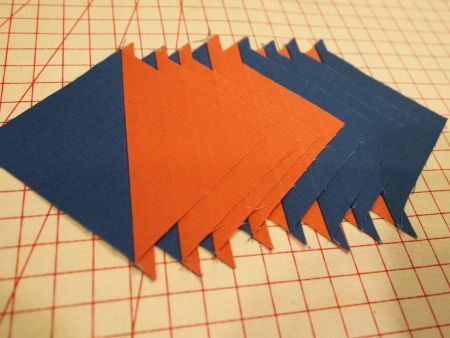 Tailors and high-end dressmakers use this tool to achieve perfectly flat seams with no shine. Sally Collins uses her acrylic ruler for the same purpose. The advantage of using wood is that it absorbs the heat and steam from the fabric. The result? Absolutely flat and perfectly pressed blocks! And really, someone who rarely cooks doesn't need three cutting boards! I've always wanted one of these glass quilt cases -- thanks, Shelly! Sinta of Pink Pincushion shared a great tip to help me get caught up on my Blocks of the Month. Come back tomorrow for WIP Wednesday and I'll share it with you! 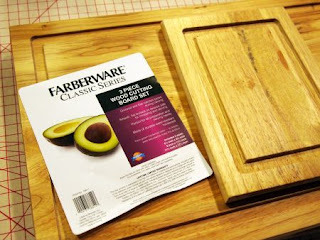 I do that with my 12.5" square ruler, but a cutting board is a nice idea, too! You really are my sewing guru. Good idea with the cutting board! 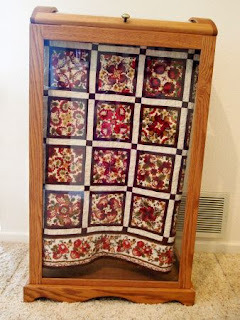 The quilt case is beautiful along with the quilt hanging in there!!! 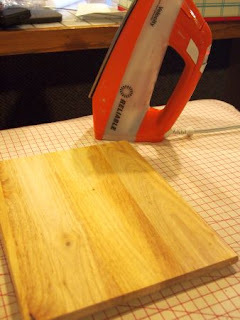 Never thought to try that for after ironing..now I need some new wooden boards. Love the glass case - never seen one of those either - how big is it?? - would certainly keep your quilts free of dust - and away from fabric eating cats. What a great idea! I'm going to have to try that one. Love your yard sale find, too! Have a super day! Thanks, Jennifer. Couldn't find an email addy for you, but I appreciate your comments! Oh I like the portability of a wooden cutting board, thank you! I've been using a 12 inch square granite floor tile and quickly placing the unfinished side of the tile on top of the freshly pressed pieced block to cool. The wooden cutting board would be so much lighter for moving about! lol Thank you! !